In data governance & privacy compliance, data classification tools help organizations categorize their data based upon custom or predefined policies, which can be used to ensure the security of their sensitive personal data. Growing public concern for data privacy has resulted in governments around the world taking a closer look at how organizations obtain, and process, sensitive personal data. 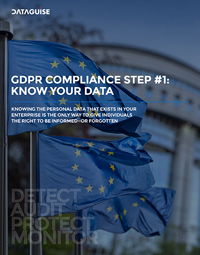 This has resulted in the creation of new stringent data privacy laws, such as the General Data Protection Regulation (GDPR) and California Consumer Privacy Act (CCPA). What type of sensitive personal data is collected? Where is sensitive personal data stored? Who has access to sensitive personal data? How secure is sensitive personal data & does it adhere to compliance regulations? For customers needing customized data classification policies, DgSecure provides a powerful, yet simple to use, policy builder capable of categorizing data based upon an organization’s specific needs. Start with predefined sensitive types, such as credit card number, social security, email, etc., adding additional sensitive types based upon organizational customizations. Once categorized, access to classified sensitive data is tracked on the DgSecure platform, allowing organizations to monitor the data over time. DgSecure’s persistent classification provides valuable data insight, which can be integrated with an organization’s access control system to ensure constant privacy of sensitive personal data while in motion or at rest. Dataguise customers can review the results of their data classification tasks through the DgSecure Dashboard or via file export, across multiple supported formats, including pdf, csv, etc. Whether through the dashboard or export, organizations can analyze the data easily in order prioritize vulnerabilities based upon data categorizations. Running Dataguise data classification across an organization’s repositories is simple as 1-2-3. First, pick a predefined policy or create a custom one using the policy builder; pick the repositories to run the policies against, either a single instance or over scheduled intervals; wait for the results and analyze the data. It’s that simple! Learn more about DgSecure’s powerful, easy-to-use, and flexible data classification tool, contact us today! 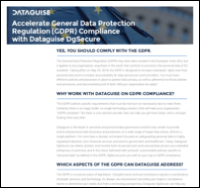 Contact us today to schedule a demo of DgSecure and find out how Dataguise can solve your GDPR & data compliance challenges!